Cover the raisins with warm water and soak them for 10 minutes. In a saucepan, boil the anise seeds in the water for 5 minutes. Lower the heat and simmer for 10 minutes more. Blend the pistachio nuts, drained raisins, ground cardamom, and milk in an electric blender and set aside. Strain the anise water and stir the honey into it. Then add it to the mixture, stir well, and chill. 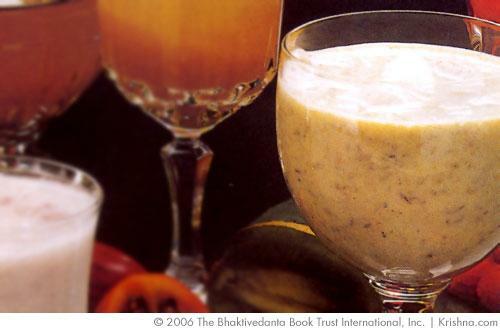 Serve each glass of thandai garnished with a sprig of mint leaves. Vegan Variation: Substitute the 2 1/2 cups milk for an additional 2 1/2 to 3 cups water. The milk mellows the spices, so using only water will produce a stronger drink. Other traditional recipes call for 1/2 teaspoon rose water, 1/2 teaspoon poppy seeds, or 1 teaspoon peppercorns for additional flavoring. Some recipes suggest almonds instead of pistachios. And other recipes call for fennel seeds, saffron, or magaztari (watermelon) seeds. We suggest trying this recipe, and then experimenting with variations on flavor once you have tried it. Submitted by Anonymous (not verified) on Fri, 06/10/2011 - 11:43. Submitted by Jagadeesh (not verified) on Wed, 05/11/2011 - 02:43.
where and when to use the 425ml water mentioned in ingredients. please provide the correct preparation method. I was ready with all ingredients but where and how to use the 425ml water. Submitted by Pishima on Wed, 05/11/2011 - 11:45. The water is used in step 1 of the preparation instructions and is then combined with other ingredients in further steps. Good luck with your preparation!